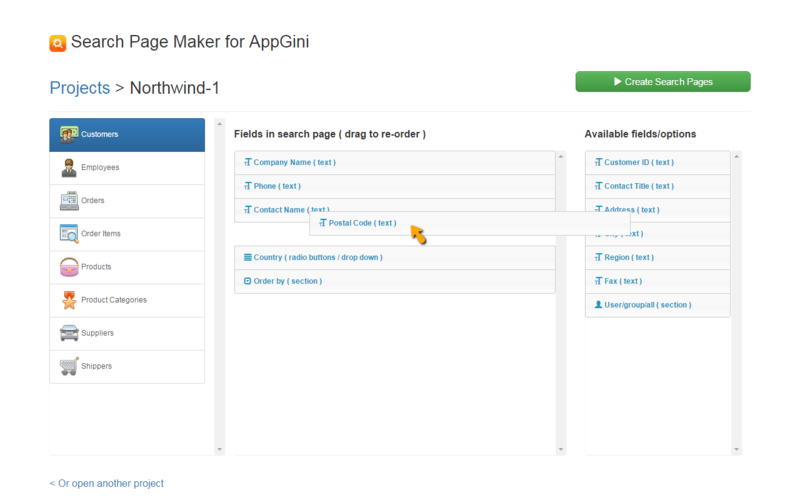 Search Page Maker (SPM) enables you to build user-friendly yet powerful search pages for your AppGini application by simply dragging and dropping the fields you want to include in search. User-friendly and powerful search. SPM plugin allows you to create beautiful and user-friendly search pages, with support for date pickups, date and number ranges, auto-complete drop-downs, radio button options, and other easy-to-use search controls. Simple and advanced search modes. Most of your application users would just love the new search pages created by SPM due to being simple yet powerful. However, the more advanced users might still want more control over search criteria. So we added a 'Switch to advanced search mode' button that switches between the SPM search page and the standard one generated by AppGini. Fun to use! SPM plugin makes it very easy to design the search page for each of your application tables. It's as easy as dragging and dropping fields to include and order them. And you can also specify whether to show the 'Sort by' options or hide them. Easy installation. To install SPM into any of your AppGini-generated applications, just unzip it into the application folder. Once you do this, you can access SPM from a 'Plugins' drop-down menu that will automatically show up to the admin user. Which version of AppGini is required for SPM? AppGini 5.50 or above is required. If a new version of AppGini is released, do I need to update SPM as well? Usually not. However, if an update is needed we'll issue it free-of-charge. I already have another plugin installed. Is it safe to install this plugin to the same app into the same plugins folder? Yes. AppGini plugins share a common set of files that ship with all plugins and are safe to overwrite. Plugin-specific files are installed into a separate subfolder under the plugins folder. So, it's safe to extract this plugin to the plugins folder, overwriting existing files. Both plugins will continue to work fine. If you make a new version of SPM, do I have to pay to upgrade? No. If you buy SPM, you get free life-time updates to it. I have several AppGini applications. Do I have to buy a separate license of SPM for each? No. If you buy SPM, you can install it to all of your AppGini applications. However, just like AppGini, if you are a team of developers who use AppGini as part of your development toolset, each developer should have a separate license. I noticed that SPM can automatically configure the hooks. If I have custom hooks in a project, will SPM overwrite them? No, it will just insert a single line of code into the tablename_init hook, directly after the function definition line ... It won't affect any of your hooks code. I have a question not addressed here ... how can I contact you? 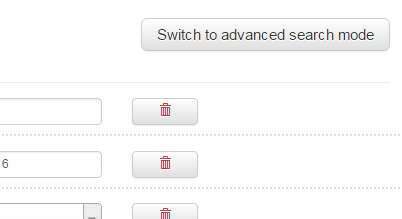 Fixed a bug with displaying filtered values for required lookup fields in filters page. Added a refresh button to the 'Select output folder' page. Fixed bug with detecting jquery file version that caused SPM to stop working on apps created newly by AppGini 5.70. Fixed bug with searching multiple-choice drop-downs where no results were returned. Updated header.php to load jQuery version supplied with AppGini 5.70. Code refactoring for 'Select output folder' page. Included new table icons shipped with AppGini 5.70. Fixed a bug with date format when searching a date range. Fixed a bug that took place when running SPM on PHP 7. More descriptive path errors in 'select output folder' page.